I am very pleased to present to you Tara O’Grady’s new album, Good Things Come to Those Who Wait. As you know if you have been reading this blog for a while, last year I started spotlighting artists who were having fund drives to make their next albums. Of the various drives I have featured so far, O’Grady’s was the first to produce an album. So Good Things Come to Those Who Wait is an album that some of you may have helped make. I thank you for that, because it’s a good one. For now, Tara O’Grady is a jazz singer. I say for now, because some of Good Things suggests that she has other options. Her backing band includes the drums, stand-up bass, and piano that you would expect. But there is also acoustic guitar, harmonica, fiddle, accordion, even tin whistle. So O’Grady is not afraid to bend the rules, but she and her band make this all sound natural. O’Grady sings in a dramatic alto that can sound like some of Aretha Franklin’s jazzier moments. This voice is something of a pose, and she drops it for a bonus track in which she sings in a poppier voice. To call her vocal a style a pose is not a criticism here; it perfectly suits what she is after. Good Things is a collection of songs of idealized romance. These are not songs of experience, but rather of imagination. O’Grady sometimes winks at the listener to let us know that she understands that love isn’t really like this, but she captures the dream beautifully more often than not. This separation of dream from reality is never clearer than in the song Let Me Be Your Audrey. Audrey is Audrey Hepburn, and the lyrics make references to some of her movies. O’Grady knows that she is offering a fantasy here, and she makes it sound very appealing. Some of the best moments on this album come in songs that mix this dream quality with romantic yearning. Shadow Blues opens the album with a woman who wants one name to fill out her dance card for the rest of her life. Later, November Moon is a gorgeous ballad with some Irish touches, concerning a woman who may be losing her lover. Tara O’Grady wrote all of the lyrics here with two exceptions. Trouble in Mind is a cover of the classic blues song. Think of Me is another musical wink on O’Grady’s part. The words are excerpted from a poem by Thomas Hood, Lines to a Lady on Her Departure for India. Hood describes a series of extreme situations, and asks the lady to “Think of Me”. There is an element of absurdity about the whole thing, and O’Grady delivers this perfectly by singing the song straight up as a ballad of romantic yearning. The poem is actually a satire of an earlier work by Thomas Hood’s brother-in-law, John Hamilton Reynolds. I mentioned that O’Grady has other options besides jazz. Waiting For You has the sound of an early soul ballad, and it is one of the most powerful vocals on the album. Goodnight Nora is a beautiful duet and a lullaby of the love of two newlyweds. The male singer is Alan Bennett. I have to say that I would love to hear this one recorded again; Bennett is not a bad singer, but his voice and O’Grady’s are not well matched. The song is wonderful, and deserves a better treatment. Goodnight Nora should have been the last song on the album. It is followed by a bonus track, Love on the Underground. This is a tale of an almost-encounter on the subway in New York City. O’Grady uses her voice here very differently than she does anywhere else on the album. She goes for a light tone, and the whole thing sounds like what Bare Naked Ladies might come up with if they wrote a love song. I found the song enjoyable, but it belongs on a different album. The rest of the album casts a wonderful romantic glow, and powerfully evokes a time that is either long gone or never existed at all. It is a world that appeals in the same way as a well constructed world in a fantasy novel. O’Grady’s playfulness only makes it more appealing. I can’t wait to hear what she does next. I want to stay with jazz singers for just a while longer, to lead into my next album review. So here is Una Mae Carlisle singing her hit Blitzkrieg Baby, with, I believe, Lester Young and his band. This song has been collected in a number of places, and I would usually give a purchase link for an album by the artist. But this one is for a various artists collection with the somewhat misleading title of Ladies Sing the Blues. The music isn’t blues at all, but the album is a great introduction to classic jazz singers and their art. So, if Oliver di Place is the first place you ever heard a jazz singer, this album would be a great next step. I mentioned that Blitzkrieg Baby was a hit in its time. Can you imagine a song like this about a current war? It wouldn’t work. 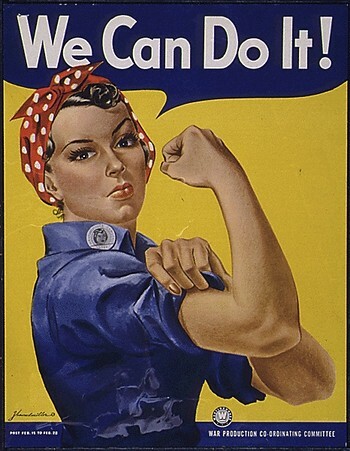 The song belongs to my parents’ generation, and is specific to World War II. The Vietnam War forever changed how Americans feel about the wars we fight. The attack on the World Trade Center might have changed things back again, but the sense of a nation united against a common enemy was squandered in the handling of the wars in Afghanistan and Iraq. Now we are back to questioning the motives of our wars again. While this is probably healthier for us as a nation, something is lost as well. Blitzkrieg Baby reflects a time when the nation as a whole believed that it had an important job to do. I have never lived in a United States that felt that way, and I can’t help wondering how it would feel. Jazz is a musical form with certain strictures. And yet, with its emphasis on improvisation, jazz is a form that prizes individuality perhaps more than any other musical genre. So there is a natural tension there. The situation is even more interesting for the jazz singer. Not only must they observe the strictures of form, but their performance is also bounded by the need to serve the lyric. Actually, in an upcoming post, I have an example of a jazz singer who does not sing words, but that’s for later. For now, I will note that even with need to serve both form and text, jazz singers have a number of ways available to express themselves. Here are five who do it beautifully, each from a different angle. Hello, Officer is a Rachel Pearl original, but the song has a classic feel. Pearl uses a small group here, but it is easy to imagine a full big band treatment. The song is flirty and fun, with a mischievous wink. 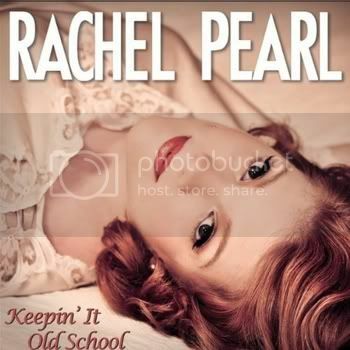 Here and on the other songs on Keepin’ It Old School, Pearl delivers performances that are just perfect for her material. My only gripe is that Old School is just four songs long. Hopefully, Pearl will have another full length album out soon. 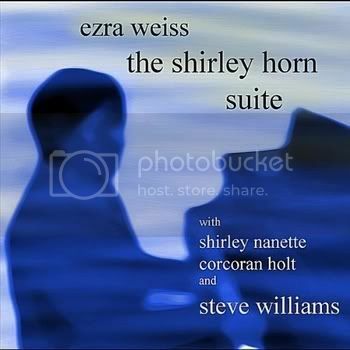 Shirley Nanette is channeling Shirley Horn here, on an album-long tribute to Horn by Ezra Weiss. Horn was both a singer and a pianist, and Weiss the pianist is directing the show. Ezra Weiss would like everyone to look into Shirley Horn’s music after hearing this, and I must admit that that is what I had to do. I found that Weiss and Nanette both get Horn’s approach perfectly, but they also are their own artists. Weiss takes a delicate approach on Shirley Horn’s Sound of Love, opening with a single note line on the piano, and only expanding on it slightly as the song progresses. Nanette enters softly, and teases out of this delicate ballad all of the nostalgic yearning in the words. Nanette and Weiss both leave plenty of space in this music, and it works to deepen the mood. This is also a great lyric, using the most subtle of our senses, smell, as a metaphor for the passage of time. That may sound strange, but it really works. Nanette is a guest on this album, singing on about half the tracks. Both the delicate touch and the full emotion of the music prevail throughout the album as a whole. I often single out a jazz singer for their work on a ballad, and Andrea Wood does fine with those. In particular, her version of Someday My Prince Will Come is a jaw dropper. But Wood and her band really shine on the uptempo songs as well. Comes Love is a standard, and it is a playful and flirty song. But Wood also renders it as a funky workout, and it really cooks. The rhythm section hits it hard, and Wood rides the wave on top, but she never has to shout. The band takes a flight of fancy in the solo section in the middle, and it all comes back together beautifully, so Wood can take it home. This is a great way to open an album, and varied pleasures follow. Wood also shows a fine feel for Brazilian-flavored songs. 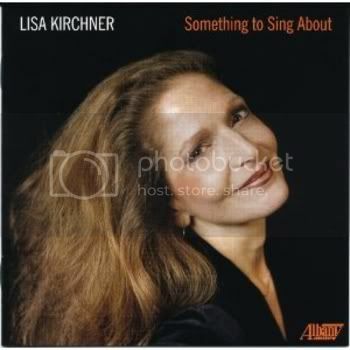 Lisa Kirchner sings songs from the American songbook. For other artists, that might mean Cole Porter, Lerner and Lowe, maybe even Stephen Sondheim for a stretch. I am quite sure Kirchner could do justice to any of those, and maybe she will in the future. But here, Kirchner’s American Songbook includes Charles Ives, Ned Rorem, and Samuel Barber, to name a few. Maybe these names are not even familiar to some of my readers. They were 20th century classical composers. So was Kirchner’s father, and some of these composers were visitors to her home in Kirchner’s childhood. So Something To Sing About is certainly a jazz album, but many of the songs were born as art songs. The album’s 18 songs also include two Lisa Kirchner originals that sound right at home in this company. Kirchner has a richly textured voice, and she purrs her way through Leila’s song. She moves around the beat, elongating or shortening notes to enhance the emotion of the piece, and she does this very well. Her use of dynamic shifts is very gradual and subtle, and all the more effective for it. The odd-sounding instrument you hear is an accordion, played in a way I have never heard before. Modern classical music can be intimidating to listen to, but don’t let yourself be scared off of this one. Something to Sing About is a treat from start to finish. America is the only song in this set that has no bass part. 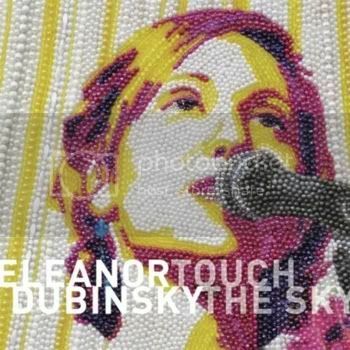 Eleanor Dubinsky constructs her songs in efficient ways, with some parts implied but not played. Her voice is a low alto, but it floats like smoke. There is no lack of feeling here, but it has an almost deadpan quality, and the emotions get stronger with repeated listens. Some of the songs on Touch the Sky are in Spanish, and the Latin influence is clear even on the songs that are in English. Dubinsky’s songs build slowly, with America being a fine example of this. Dubinsky enters singing over just a single percussion line. Just when you think that’s it, the acoustic guitars enter, followed by additional percussion. The song comes apart differently at the end. Everything the song needs is here, and nothing else. This is one of those times when a song told me what to do. The Man Who Sailed Around His Soul popped into my head as I started my day, and said, “post me”. XTC was always a band that used strong rhythms, and, especially late in their career, they loved to experiment with their sound. Most of it worked, while some of it flopped amazingly. The album Skylarking is a microcosm of this. It’s a flawed album that I always find myself drawn back to. The album was produced by Todd Rundgren, and some of it is almost ridiculous for how overwrought the emotions are. In particular, 1000 Umbrellas is a song I often find either laughable or pathetic. And yet, the good stuff on this album is great. Man Who Sailed is a fine example. The lyrics describe a man who looks back over his life, and finds much to regret. His tale is told against an almost jaunty jazzy musical setting. The tension between the sound of the song and its content give this one its power. This is, as far as I know, the closest XTC ever came to exploring jazz, and it is a sound I wish they would have done more with. As I write this, Teresa Storch has 16 days to go to complete her Kickstarter campaign for her new album The Honesty Kitchen. The first thing I noticed about Storch was her voice. Her music is not blues, but her voice is a bluesy moan, and she does this as well as anyone I have ever heard. Some of the songs in her video look like they have jazzy touches, (one has fiddle and trombone together! ), and I can’t wait to hear them. Happy Girl in its present form reminds me of the quiet intensity of a young Tracy Chapman. Please help Storch finish The Honesty Kitchen if you can. Thank you for whatever you can do. 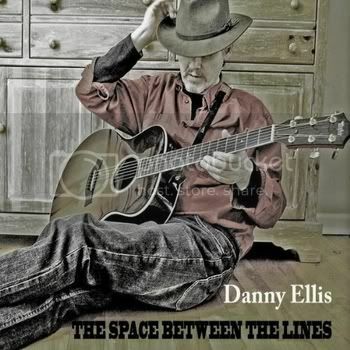 The Space Between the Lines is, in a sense, Danny Ellis’ first album. This Tenderness, his actual debut, was a set of electronic soundscapes with trombone and a scattering of other acoustic instruments humanizing the proceedings, and helping the songs to connect emotionally. 800 Voices was Danny Ellis telling his harrowing story of growing up in the notorious Artane Industrial School in Dublin, and the music was based on traditional Irish music, leavened with other types of music that Ellis heard growing up. Having made that album, Ellis was finally free to make an album of songs that sound like himself as he is now. In the liner notes to The Space Between the Lines, Ellis describes how these new songs came pouring out of him. Lines has a consistent sound, and planned or not, there is a consistency of theme in the lyrics. The arrangements here are spare, but they sound fuller than they are. Ellis plays acoustic guitar, and his parts are doubled and enhanced by mandolin or a hybrid of guitar and bazouki called a bazar. There also beautiful fiddle parts. On some songs, Ellis overdubs his own piano or organ parts. I am pretty sure that I also hear bass parts on most songs, but there is no bass player credited in the album notes. And that’s it. In particular, there are no drums, but none are needed, because the rhythm of this music comes through just fine without them. Ellis overdubs some background vocals, and everything sounds like a band that has played together for so long that they fill in each other’s part’s intuitively. Ellis sings in a high tenor voice that manages to be gentle and fully emotionally invested at the same time. I would say that the theme of these songs is first love. It’s true, but the phrase carries certain connotations that do not apply here. Lines starts with the song Shine, and Ellis describes how he thought he knew what love was until he met his current love. His narrator now realizes that there was no love between his parents, so he never saw the real thing modeled by his role models. The song is a profound thank you for the gift of real love at last. The next song, Ask, is about first love in a completely different way. Here, the narrator describes a romantic encounter from when he was sixteen, in beautiful and tender language. But, at the end of the song, we find that the song is not what it appears to be. I don’t want to spoil it for you, but it takes the listener to another place that seems perfectly natural when you get there. And the album continues, with similarly well crafted songs about discovering love and exploring its depths. Then, in the later part of the album, a second theme emerges: the idea of home. The “home” songs include Another Dublin, which is about the differences between how a place feels in memory and in actual fact. 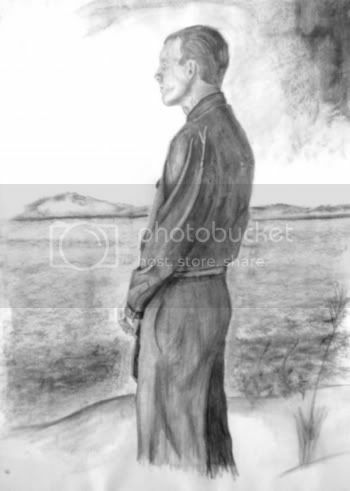 Ellis’ narrator here goes to Dublin, hoping to experience the good things about the city of his youth, but discovers instead that that city is as gone as his youth itself. In the other “home” songs, home is as much an emotional place as a physical one, and the ideas of home and love become intertwined. This is all expressed in beautifully poetic lyrics. My description may have made it sound like Lines has a premeditated quality, but that is not the case at all. I tend to think that Ellis was not consciously developing a theme either when writing or recording these songs. They have a feel that is completely natural and sincere. The Space Between the Lines is the sound of one man’s heart speaking, beautifully. Blog business: although I hate to break the mood, I am late in congratulating Adam Sweeny and the Jamboree on the success of their Kickstarter campaign. Thank you to all who helped. While we are on the subject of the blues, let me present Lightnin’ Hopkins. Hopkins was one of those bluesmen who disappeared and was then rediscovered during the folk music revival of the 60s. 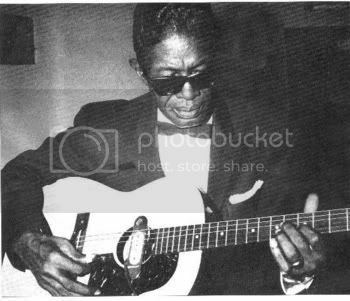 Lightnin’ Hopkins, to my mind, is best appreciated as a solo artist, playing acoustic guitar. Listen to his See See Rider, and you might think that he was a sloppy player who couldn’t keep time. But that is because we are used to blues fitting a tight, even restrictive, format. Hopkins knew just what he was doing, and his guitar obeyed his will. Yes, he would elongate or compress musical phrases, especially when he soloed. But the result was a dramatic tension and release. Hopkins made the blues an unsettled music about unsettled emotions. His music has a real power that most blues players nowadays cannot or will not achieve. That doesn’t mean that their music is bad, but it doesn’t have the untamed feeling that Hopkins achieved. In the course of his career, Hopkins also made many recordings with small groups, and there is some great music there as well. But group settings tended to reign him in, and his solo works are it for me. The Blues. Those two words conjure a particular sound. Like so many kinds of music, you can hear it in your head, but you may not be able to define it. But try this: get together with a group of people to discuss it. You might get a surprise. You might find that not everyone hears the same music in their head that you do. You see, the blues is not a static form. It has changed over time, and that process is still going on. The earliest blues is almost unrecognizable to most people. And some artists who started with the blues are now making music that strains that definition. Here are five songs to show what I mean. That’s not nearly enough, so, as a survey, this is very incomplete. But I think it is a fair starting point. The music here, stylistically, spans about fifty years of music. But these are all contemporary artists, and these albums have come out within the last year. Nevertheless, taken together, they take us on a long journey through the blues. Walk with me. The blues comes from Africa, and then arrives by force in the United States, where it is influenced by Western music to some extent. By the time it started to be recorded, there were black string bands throughout the American South. In addition to the familiar guitars, there were fiddles, banjos, and mandolins. This is the music that inspires The Little Brothers. 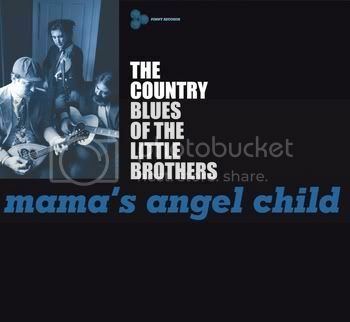 Their version of Crow Jane has a raw sound that is a perfect reflection of these early blues songs. The musical phrases are longer than you hear in newer blues, and time can expand and contract in this music. Listen to the early recordings that Lightnin’ Hopkins made as a solo artist, and you will hear where this music went. The Little Brothers are a trio, with fine male and female singers. They preserve this early blues sound, but they do not sound like scholars or preservationists. They invest this music with all of the passion it ever had. Pete Anderson first came to my attention as Dwight Yoakum’s first producer. So this album really took me by surprise. 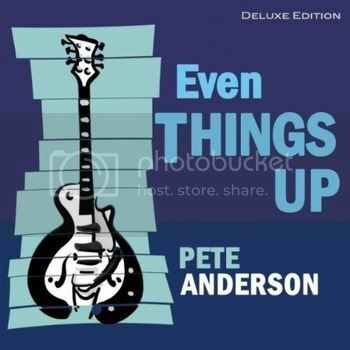 The songs on Even Things Up are soaked in blues, and the styles range from the jump blues heard here to Rhythm and Blues and Southern rock. Anderson wrote or co-wrote all of the songs, and it all cooks. Actually, One and Only Lonely Fool isn’t quite jump blues. In the 1930s, many of the big bands had singers, including blues singers like Jimmy Rushing. As these bands began to shrink, the singers stayed on in some cases, and a blues/ jazz hybrid called jump blues developed. First T-Bone Walker and then B B King took this music and began to emphasize the electric guitar in the arrangements, with stinging lead lines to cut through the cushion of horns. This is where One and Only Lonely Fool fits in. It doesn’t take too much imagination to see how the music went from here to James Brown. The pivot point for blues is Chicago in the 1950s. The tale of how Southern blues artists like Muddy Waters came to Chicago and plugged in their guitars is well known. 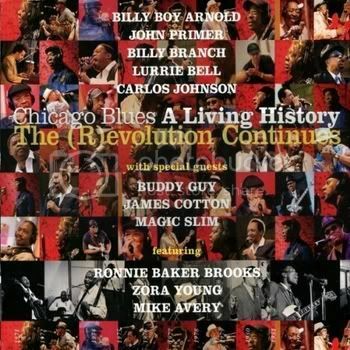 On The (R)evolution Continues, the people who run Raisin’ Records have brought together a fine roster of artists with deep roots in the Chicago blues scene to present a survey of the rise and development of Chicago blues. The album is actually the second in a series called Chicago Blues A Living History. This one includes a booklet that gives the year each song was written, and places it in the context of the development of the Chicago sound. It’s a beautiful package, and a great place to start any exploration of this music. Of course, the most important thing is that the music is great. John Primer is not the best known artist on this album, (that would be Buddy Guy or James Cotton), but his performance of Chicago Bound is a high point, and the song fits this post perfectly. 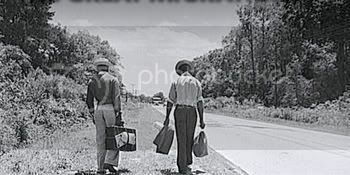 The song is a Jimmy Rogers tune from 1954. He recorded it shortly after leaving Muddy Waters’ band. The interplay of the guitar and piano and the feel of the rhythm section are hallmarks of the Chicago sound. So is the harmonica sound on the solo. After the 1950s, some Chicago artists began to adapt to Rhythm and Blues. Blues is still very much part of the sound, but there is a gospel influence in the big voices, and this is music for dancing. Peaches Staten is a modern Chicago artist who shows how this played out. 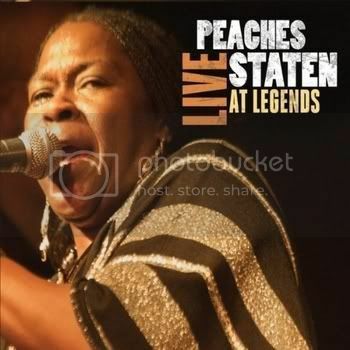 Her album Live at Legends has bluesier numbers and others that are more soul music. There is even one zydeco number, where she plays the washboard. Through it all, her voice growls and purrs, and there is never any question of how she is feeling. I Know You Love Me finds a stylistic balance. The song opens with a funk line in the guitar that is soon joined by the drums and bass. But the harmonica and Staten’s voice on this one are pure blues. The overall sound of this album is what modern blues sounds like in one of its guises. It’s a long way from The Little Brothers, but the passion is still there. In the 1960s, white musicians began to discover the blues. Notable examples from England included John Mayall and his bands, and the Rolling Stones. A little later, American rockers like the Allman Brothers began to follow suit. From their beginnings as actual blues bands, these artists became rockers who used blues as an important ingredient in their music, and blues-rock was born. The guitar gods like Eric Clapton come from this period. Tom Principato began making his own blues-rock in the 70s, and he’s still at it. Without the context of this post, most people would probably call Don’t Wanna Do It southern rock, and that would be fair. Chuck Leavell from the Allman Brothers even plays the organ here. But now I hope you can hear the blues in this music as well. Elsewhere on this album, there are a couple of Latin-tinged songs. Keep in mind that Carlos Santana started out as a blues guitarist, and that Black Magic Woman was written by Peter Green shortly after he left John Mayall’s band. So overall, Principato delivers a tour of where blues rock has gone. 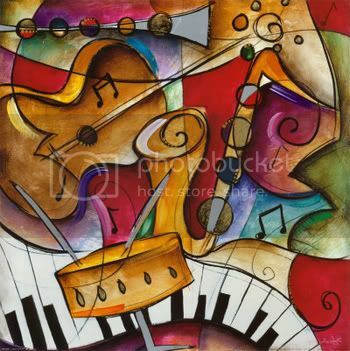 A couple of instrumentals also have a delicious jazzy flavor to them. And Principato, in both his singing and playing, delivers all of the passion of a bluesman. In her younger days, Joni Mitchell seemed to believe that a relationship could be a complete merger of two personalities, with nothing held back. But her later songs take a different view. Yvette in English presents a chance meeting between a man and a woman. They are separated by the barrier of language. And yet, she can make the offer, “Please have this little bit of instant bliss”. In Cary, the joy promised to never end, but now, the whole thing has a quality that is more tentative and fragile. Perhaps, it is more valuable as well. The quality of the music reflects this as well. In the later part of her career, Joni Mitchell has become a fine storyteller, and Yvette in English is a fine example of this. Country music is a hybrid musical form. It represents a blending of many older musical genres, and that certainly includes the blues. The music of Abbie Gardner makes this connection very clear. I already knew this from Gardner’s work with Red Molly, but Gardner’s new album Hope is still a revelation. For one thing, I love the sound of the National steel guitar, and Gardner plays it here far more than I have heard her do before. For another, where Red Molly performs roughly an even split of original material and covers, and that includes songs by the three different artists who make up the band, Hope is Abbie Gardner’s show, and she wrote all but three of the album’s songs. The last element that makes Hope something special is that Gardner gets to show off her jazzy side, which mostly doesn’t fit with what Red Molly does. Naturally, I am eager for the next Red Molly album, hopefully later this year, but Hope is a wonderful treat in its own right. The country-blues connection starts with Abbie Gardner’s voice. She doesn’t growl like some blues singers, but her slightly breathy alto has a full range of expression, whether on a bluesy burner like Break It Slow, or on a tender country waltz like Hope. On jazzier numbers like Comes Love, she adds a wonderful sassiness that is perfect for the song. On the album, Gardner plays the National, the dobro, and a lap steel, with the National often featured. So she goes from a percussive guitar sound to a twangier one, and she can also add lead lines that are reminiscent of Bonnie Raitt’s slide work. The core band here adds Craig Akin on stand-up bass and Ben Wittman on drums. Gardner puts these rhythm players through their paces, what with the stylistic and mood changes here, but both players display amazing versatility. Akin also contributes one original song, the instrumental Do It, which sounds like it arose out of a jam session; the three musicians are having entirely too much fun here, which makes the song fun for the listener as well. Some tracks add Herb Gardner, Abbie’s father, on piano; others have Sarah Gardner, her sister, on organ. 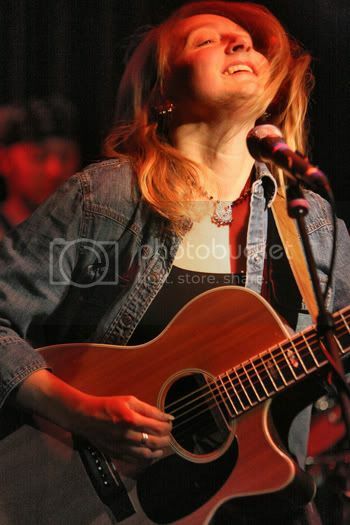 In both cases, Abbie Gardner has chosen the best available musicians for the songs. There is also a variety of background singers on the album. As a songwriter, Abbie Gardner shows a great love of classic forms. Break It Slow is the tale of a woman who fears that her relationship with her lover may be ending. The sung kicks off the album in high gear, with its uptempo blues sound, but the lyric could just as easily be a country song. 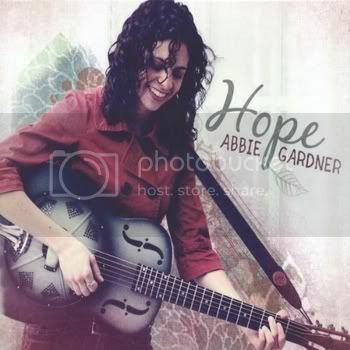 Hope is a country waltz with a wonderful cello part, and it shows Gardner’s gift for imagery. Her “glasses that shatter like broken little pieces of stars” is an image that, in the context of the song, I can see in my head as she sings the line. In all, these are stories of love sought, found, and lost, told with great eloquence. Gardner’s performances invest her words with great emotion, and thus she demonstrates her love of classic song forms. And then, late in the album, she breaks the rules a bit. Bang Bang has an ambiguity that one doesn’t usually find in country. Here, a woman who has found her lover with another woman lets the us know that she has a gun, and she intends to use it. But she might shoot her lover, his lover, or herself. She only knows that “something wants to go bang today”. Her feelings and the sense of danger are both very real in this song, but Gardner wants to present the situation, not its resolution. Nellie is a great piece of storytelling, and it describes a harrowing situation. The narrator, whose relationship with the title character is unclear, offers to help Nellie escape from an abusive relationship. Gardner tells the tale, not graphically, but with a bluntness that is unusual and brave. Finally, the album concludes with Too Soon (For Karena). This one is a beautiful hymn for a lost loved one. Coming at the end of the album as it does, Too Soon offers comfort not only in the context of the song itself, but also for all the stirred emotions that have come before. In all, Hope is an album I know I will be going back to. The playing is sometimes flashy, but always in service to the song. The writing is rich and varied. And Abbie Gardner has a great voice for blues, country, or jazz. Blog business: Take a look at the Oliver di Place community page on Facebook, and put a like on it. 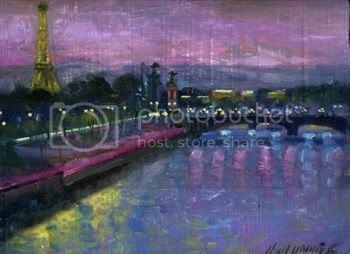 Not only will you see announcements of new posts here, but there is also exclusive content, including new release announcements and other news about Oliver di Place artists. Have you heard Poetry Man this week? Maybe for the first time in years? Phoebe Snow passed on this week at age 60. Her story has much to tell us about the business end of how music gets made. Poetry Man, of course, was the monster hit from her 1974 debut. But Harpo’s Blues comes from the same album. The voice is unique, and it is certainly the same one on both songs. Snow’s voice shimmered, like gentle ripples on a moonlit pond. But, where Poetry Man leaned towards the pop-folk sounds of the then-new singer-songwriter movement, Harpo’s Blues is a wonderful bluesy jazz number. That debut album found Snow merrily genre hopping, and hitting most of her marks beautifully. It’s the kind of thing that no major label would touch nowadays. But in 1974, it was a viable way to launch a career. So what were some of Phoebe Snow’s hits from her later albums? Stumped? Let me tell you what happened. Before the release of Phoebe Snow’s second album, she had a child. Daughter Valerie suffered from hydrocephalus, a severe form of brain damage. Phoebe Snow made the decision to care for her daughter at home, and this occupied far more of her time than the development of her musical career. So it was that many artistic decisions, including the choice of producer and material, were made for her. Because she transcended musical genres, this meant that her labels had a hard time finding material that was best for her. In some cases, like turning her into a rock singer for one album, poor judgments were made. Even so, that remarkable voice never faltered, and it is well worth picking through the rest of her albums for the many gems that are to be found there. 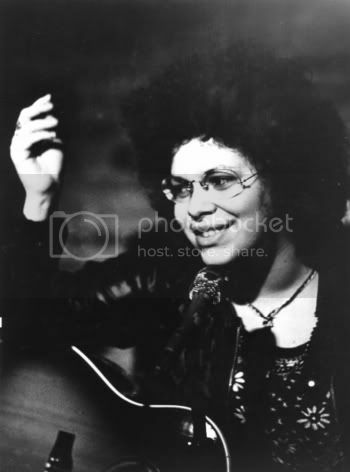 As a parent myself, I applaud Phoebe Snow for the courage and determination she showed in deciding to keep her daughter out of institutions. I don’t know if I could be that strong. Still, can’t help wondering about the music she might have made… Valerie died in 2007. Phoebe Snow recorded only one album after her daughter’s death, Live in 2008. The amazing voice had gained some muscle since her debut, but all of the soulfulness of her youth was still there. If only she had had more time.